Brand new 3+1-bedroom home with a separate office/den located in a cul de sac in Vintage Views, Heritage Hills. Open floorplan and vaulted ceilings for a bright airy feel. 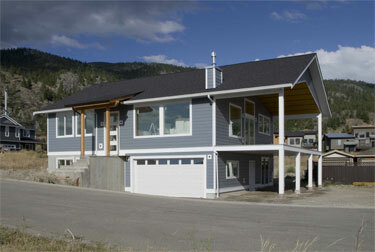 Patio doors open to a sheltered south-facing covered deck 36'x12' with views of Skaha Lake. Large master bedroom with walk-in closet and his/hers sinks in the 4-piece ensuite. Downstairs rec room, large mud room off the double garage. Office/den opens onto a big patio below the deck - designed for extra covered parking if needed. Bare-land strata fee is $15/month. No restrictions. Constructed by Eagle Ridge Design Ltd. Home warranty. Expected completion date Sept. 30. Price includes GST and kitchen appliances.